“Idiots” is a work of concretism in strive towards poetry, an attempt to discipline oneself seriously towards practices that might seem idiotic. Allison Ahl and Sebastian Lingserius are trying to “become” the action of objects that they put into motion. It´s a virtual and actual game without reference to the meaning of actions as logic or narration. An attempt towards becoming present through following the flight of objects, games and exhaustion. It´s concrete in regards to the task, but multilayered because the aim to join the analysis of movement with precise execution. The objects serves as vehicles, lines of flight in researching oneself and ones experience with risk, physical presence and transformation. “Idiots” deals with with everyday object in relation to their movements and qualities rather than our understanding of their function. The piece sees the objects as things. Things that are more than the reduction that language makes them. It´s performed with an interest of their texture, their choreographic qualities, their sound, their way of guiding us as dancers. In the same way the body is treated as a thing, making the movements for the audience at times violent as well as funny or banal. For the performers this is left without comment, without any type of production of meaning The performers strive on with their attempts rather than contemplating on the meaning it might have created for the audience. The piece changes every time it´s performed as the objects and games never move in a exact or repeated manner. This creates a situation where Allison and Sebastian needs to constantly adapt, move quickly and throw themselves into discovering the very moment of movement. Idiots tries to look at discipline not only as a formal hierarchic power structure, but a way to find the will to experience the body as it creates itself in a situation of change. Pushing oneself in to intensity with the help of objects, the body of the other, with sound and exhaustion. 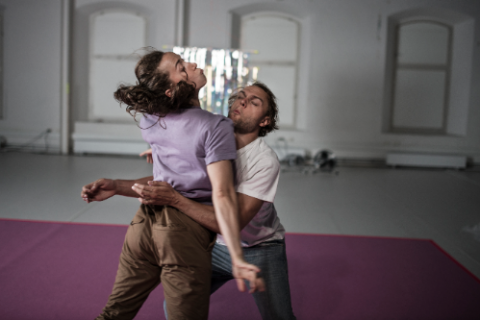 In the work and practice of choreographer Björn Säfsten the body and the mind and its connected actions are scrutinized, dissected and exposed. The focus is on creating ‘another body’, another notion of human physicality, bringing images to life that visually problematize our notion of the human nature. The physical practice expose images that occur from a certain physical action, in a chance method. The work thus takes visual turns and bends, often moulding itself whilst being performed, establishing itself a-new each time for each audience encounter. We aim to expose physical dilemmas, deliberately creating situations where the thoughts of the performer are exposed, opened up to the viewer. The work fools around with the notion of language – striving to confuse and divert the viewer from the regularity of bodily reading. The body is seen as a multiplex of wills, desires och directions, moving away from a notion of a bodily and mental entity. Changing the notion of the body and and the embodiment of the object and the relation between the two entities are central in research and presentation. The exact texture of the singular movement stand at the core of the work. Sections are created in the present moment through practices occupying the performer with a blend of orders, restrictions and physical parameters. The methods behind the work strive in a direction of non-clarity and non-singularity, exposing the trajectory of thought and movement in the performer as actions happen. Energies in the action differ from an awaiting hesitation to a certain urgency, to a deliberate stillness to outburst of action. 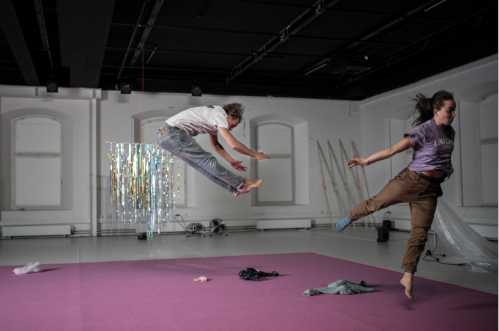 The incoherence of actions create the non-singularirty, the non-linear narrative that interests Björn and the artists working with the different choreographic works. The work goes against consensus of understanding, aiming for bringing the diversity of the audience members into the relationship between stage and auditorium, between the performers area and the spectators area. We aim to discuss how language is violent in its form of oppressing both the performers and the viewers relation to movement and body. We wish to expose the multilayered understanding the physical experience embody and how this can be brought into the private, the public and the political sphere. Choreography: Björn Säfsten, created with the performers Allison Ahl & Sebastian Lingserius. Light & Set Design: Chrisander Brun. Sound Design: Anna Sóley Tryggvadóttir. Philosopher: Per Nilsson. Music: “How Sweet To Be An Idiot” by Neil Innes © EMI United Partnership LTD. Production: Säfsten Produktion & Nordberg Movement. Co-production: Säfsten Produktion and MDT. Created in residencies at AADK/Centro Negra, MDT, wpZIMMER and SITE. Made possible with generous support by the Swedish Arts Council, the City of Stockholm, the Swedish Research Council and wp ZIMMER.